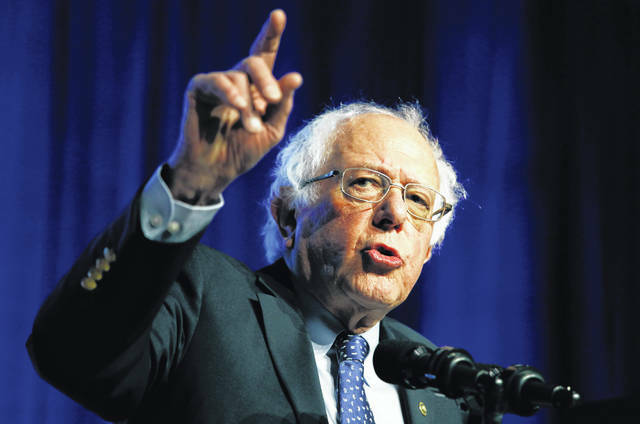 FILE - In this Monday, April 8, 2019 file photo, Democratic presidential candidate Sen. Bernie Sanders, I-Vt., speaks at a convention of the International Association of Machinists and Aerospace Workers, in Las Vegas. Sanders is heading back to the friendly turf of Wisconsin for a rally that kicks off a swing through states that are key to the Democratic “blue wall” strategy for 2020. Sanders’ event Friday, April 12, in Madison will be followed by weekend stops in Indiana, Ohio, Michigan and Pennsylvania. MADISON, Wis. (AP) — U.S. Sen. Bernie Sanders returns to the friendly terrain of Wisconsin on Friday to kick off a swing through pivotal states that are part of the Democratic “blue wall” strategy for 2020. The independent senator from Vermont carried Wisconsin by 13 points in the Democratic primary three years ago and has been a frequent visitor since losing the nomination to Hillary Clinton. He has touted his appeal to working-class and college-age voters, while fostering his network of supporters before this second run for president. Democrats have made clear that their best chance at defeating President Donald Trump in 2020 is by winning back three states Trump narrowly captured: Wisconsin, Michigan and Pennsylvania. Dubbed the “blue wall” before they unexpectedly tipped to Trump, they may have supplanted Florida and Ohio as the nation’s premier presidential battlegrounds. Sanders will hold a rally Friday night in Madison before heading to Gary, Indiana, on Saturday morning. He’ll hold a rally at a community college in Warren, Michigan, later that day, and then head to Pennsylvania for an event Sunday near the University of Pittsburgh and Carnegie Mellon campuses. Then it’s off to Ohio on Monday. “Democrats are amped up, we are fired up to highlight issues that matter to folks in Wisconsin,” Bowen said. “I definitely view Bernie Sanders as the candidate best situated to not only defeat Donald Trump but to advance policies that stem the tide of skyrocketing inequality, to finally address the existential crisis that is climate change,” Rickman said.